The camera was set for ISO 100 and Aperture Priority at f/2.8. Two Sunpak LED-160 Video Lights plus a Nissin i40 external flash unit (set for video light) were used to light the scene. 30 individual frames were extracted from the resulting MP4 video, and saved as TIF files; Adobe Photoshop was used to create the following focus-stacked composite image. Noise (graininess) has been a problem in some previous test shots using “Post Focus,” due to low light (underexposure). I changed the ISO from AUTO to 100 for this test, opened the aperture all the way to f/2.8, and added a third LED light source. This is the first time I tested “Post Focus” and felt like the camera had a mind of its own! Nonetheless, the final output turned out OK. Further research and experimentation is required in order to understand what happened and why. I bought a Godox TT685C Thinklite TTL Flash from Roberts Camera recently. I placed the order around midday on Friday, 02 November 2018 and the parcel was delivered on Monday, 05 November. Impressive! Given my negative experience with the TT685F flash, regular readers of my blog might be wondering “Why would you buy another Godox flash from B&H Photo?” More about the first part of that question in a minute. As I already mentioned, I DIDN’T buy the new Godox TT685C flash from B&H Photo. Read between the lines. I have been testing the new TT685C flash since the day after it was received. Here’s what I know so far: In a nutshell, the flash works as advertised. The Canon-compatible version of the Godox TT685 functions in five modes: a non-wireless, stand-alone mode (TTL, Manual, and Multi); and four wireless modes (optical master/slave modes, and radio master/slave modes). The Godox TT685C can do almost everything the comparable Canon Speedlite 600EX II-RT does at a price point approximately six times less than Canon’s MSRP of $579.99. All of that being said, there is one problem with the Godox TT685C and it’s a big problem in my opinion. More about this in a follow-up blog post. For my money, what makes the Godox TT685 product line of flashes special is they are cross-compatible. In other words, flashes made for different camera manufacturers (e.g., Canon, Nikon, Olympus/Panasonic, and Sony) can work together. The following photo shows the LCD of my new Godox TT685C flash. The flash is set for radio slave mode (Channel 1, Group A). 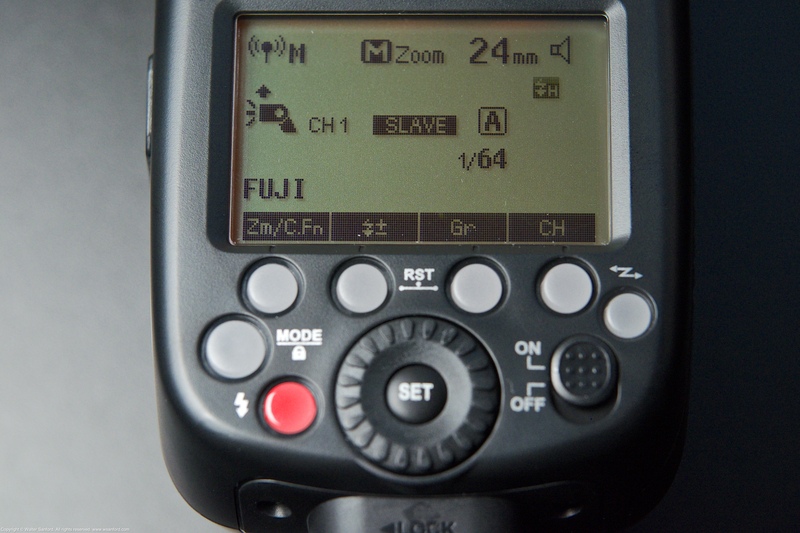 Notice the word “FUJI” in the lower-left corner of the display that indicates the Canon-compatible flash is working like a Fujifilm-compatible flash. In this case, the flash was controlled by a Godox XProF radio flash trigger mounted on the hotshoe of my Fujifilm X-T1 digital camera. A Godox TT685F external flash, fitted with a Lastolite Ezybox Speed-Lite 2 flash modifier, was located off-camera; the TT685F was used to light the photo, shown below. Also notice the icon that indicates the flash is functioning in HSS mode; the HSS icon is located below 24mm (manual zoom) and the audio speaker icon (indicating sound is on). Godox TT685C external flash LCD panel display (Slave mode). Off-camera radio slave mode works, including TTL and HSS, when the Godox TT685C is controlled by a Canon MT-26EX-RT Macro Twin Lite set for radio master. Either Godox XProF or TT685F mounted on Fujifilm X-T1 hotshoe: Camera-mounted flash is Channel M; off-camera TT-685C (set for radio slave) is Channel A. Works as expected, including TTL and HSS. Godox TT685C mounted on Fujifilm X-T1 hotshoe: Flash fires, Manual mode only (TTL, HSS don’t work); when the flash is set for optical master (in Manual mode), it can trigger an off-camera Nissan i40 external flash unit (set for SF Mode) confirming that optical master does in fact work. There’s always more to discover/learn! My odonate-related new discoveries in 2017 are presented in reverse-chronological order. 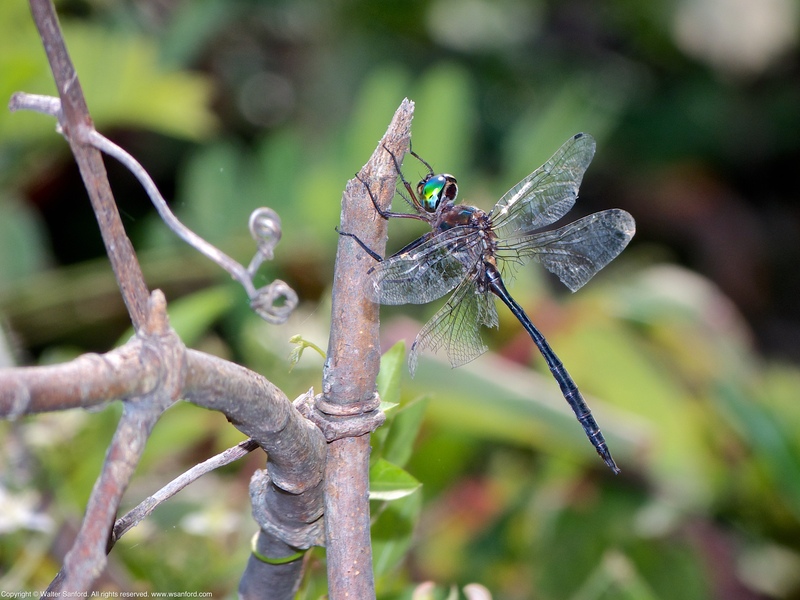 A Fine-lined Emerald dragonfly (Somatochlora filosa) was spotted at Occoquan Bay National Wildlife Refuge, Prince William County, Virginia USA. This individual is one of several males spotted during a period of a week-or-so in mid-September 2017. A Calico Pennant dragonfly (Celithemis elisa) was spotted at Painted Turtle Pond, Occoquan Bay National Wildlife Refuge, Prince William County, Virginia USA. This individual is an immature male. Notice its coloration is similar to female Calico Pennants. 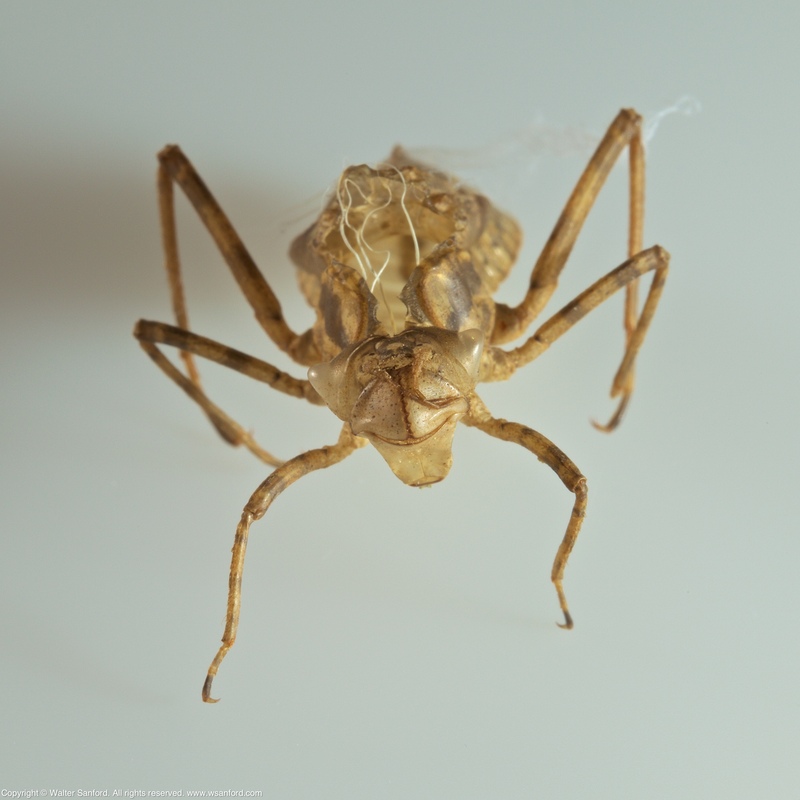 An Allegheny River Cruiser (Macromia alleghaniensis) was netted by Mike Blust at Hardware River Wildlife Management Area, Fluvanna County, Virginia USA. This individual is a male. 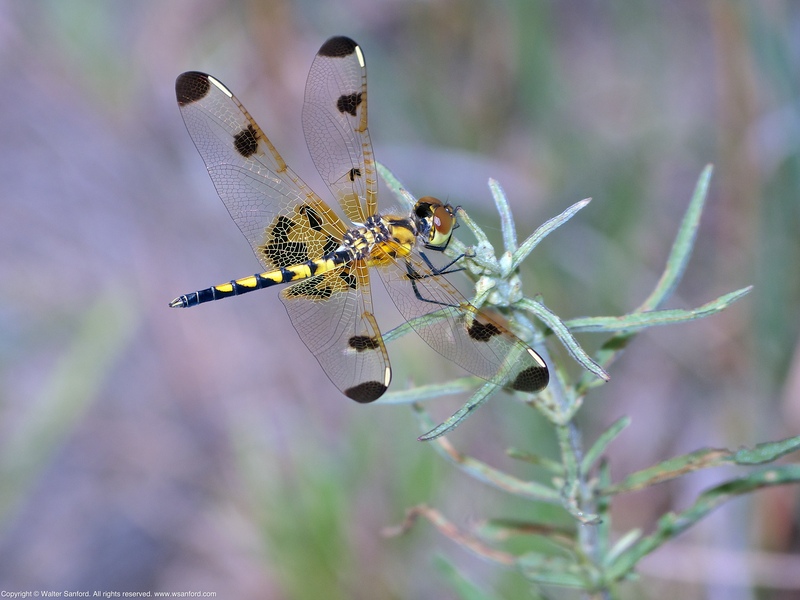 A Harpoon Clubtail dragonfly (Phanogomphus descriptus) was spotted at “Straight Fork,” Highland County, Virginia USA. This individual is a male. Sincere thanks to fellow Virginians Karen Kearney and Mike Boatwright for guiding me to this unique high-elevation habitat. It’s worth noting that I saw two more new species during the same trip: Riffle Snaketail (Ophiogomphus carolus); and Dot-tailed Whiteface (Leucorrhinia intacta). Those who know me well are familiar with one of many “Walterisms”: “I haven’t ‘seen’ something until I have photographed it.” My rationale is two-fold: 1) A photograph verifies a sighting. 2) The detail visible in a good photograph exceeds the acuity of the human eye. Suffice it to say I saw two other species but haven’t seen them. Makes sense to me! 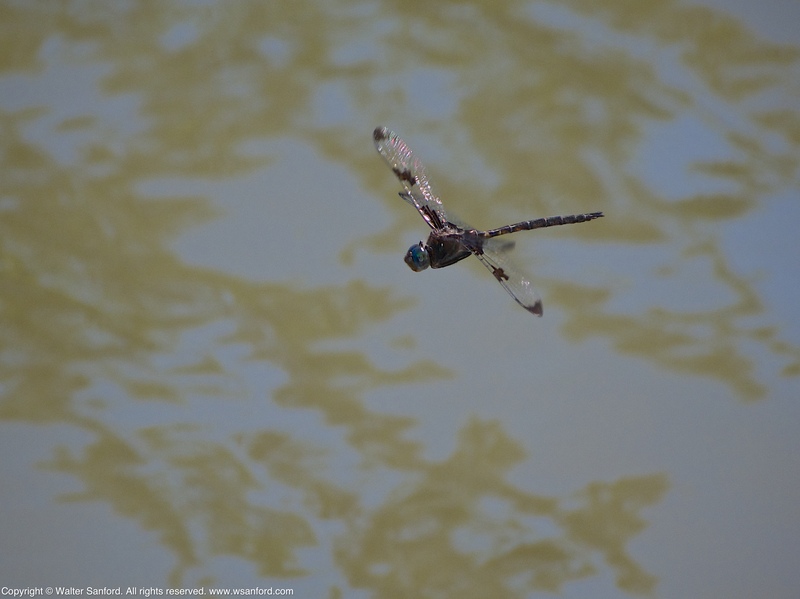 A Swift River Cruiser dragonfly (Macromia illinoiensis) was spotted at Riverbend Park, Fairfax County, Virginia USA. This individual is an emergent/teneral female. A Spine-crowned Clubtail dragonfly (Hylogomphus abbreviatus) spotted along Bull Run at Hemlock Overlook Regional Park, Fairfax County, Virginia USA. This individual is a male. A female was spotted on the same day at a nearby location. A Common Baskettail dragonfly (Epitheca cynosura) exuvia was collected at Painted Turtle Pond, Occoquan Bay National Wildlife Refuge, Prince William County, Virginia USA. 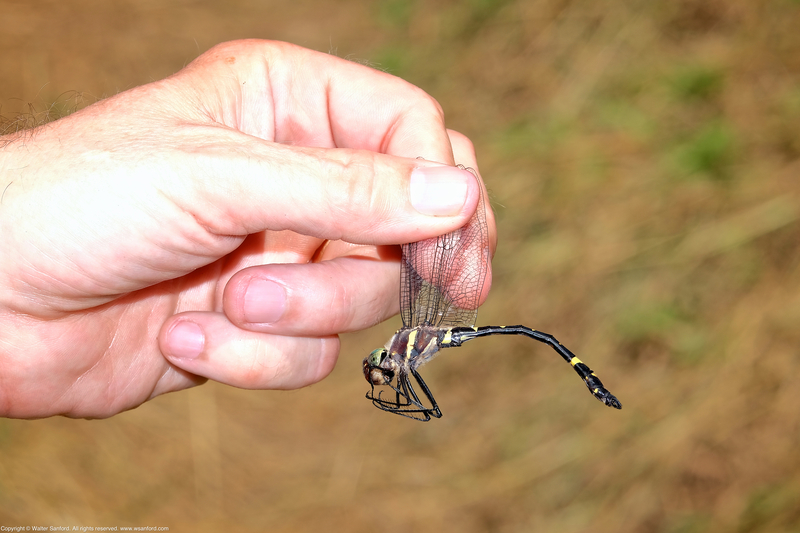 A Prince Baskettail dragonfly (Epitheca princeps) exuvia was collected from an unknown location. This specimen was on temporary loan from Huntley Meadows Park, Fairfax County, Virginia USA. On 13 April 2017, a late-stage emergent teneral female Common Baskettail dragonfly (Epitheca cynosura) was observed at Painted Turtle Pond during a photowalk around Occoquan Bay National Wildlife Refuge, Prince William County, Virginia USA. 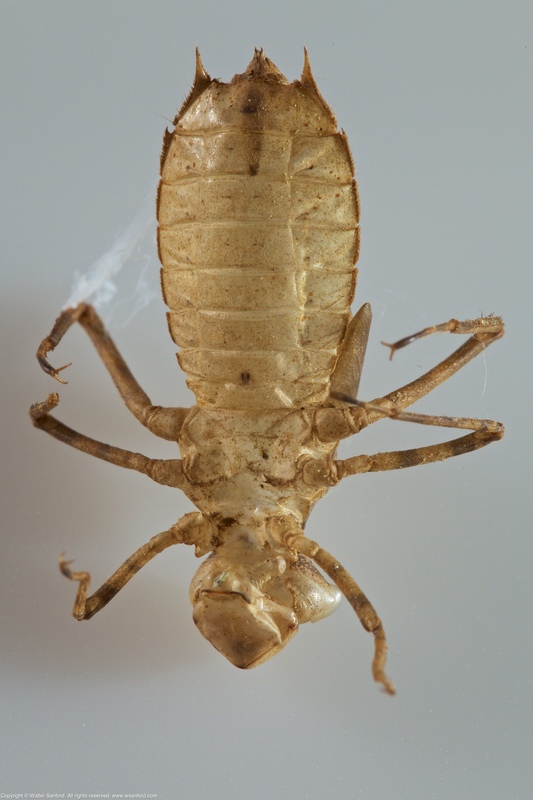 Several dragonfly exuviae were collected near the same location as the emergent teneral female. 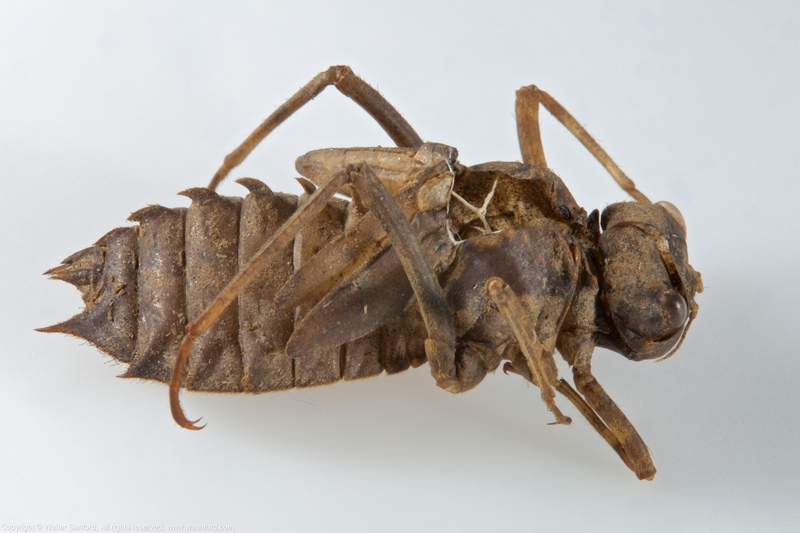 All of the exuviae look identical, although there is some variation in size. 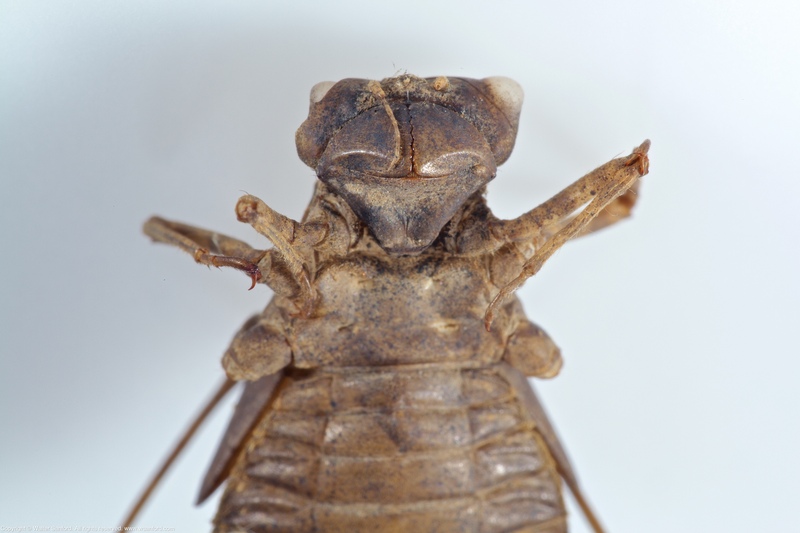 A two-step process was used to verify the genus and species for one of the larger exuvia. This specimen is approximately 22 mm (~0.87 in) in length. 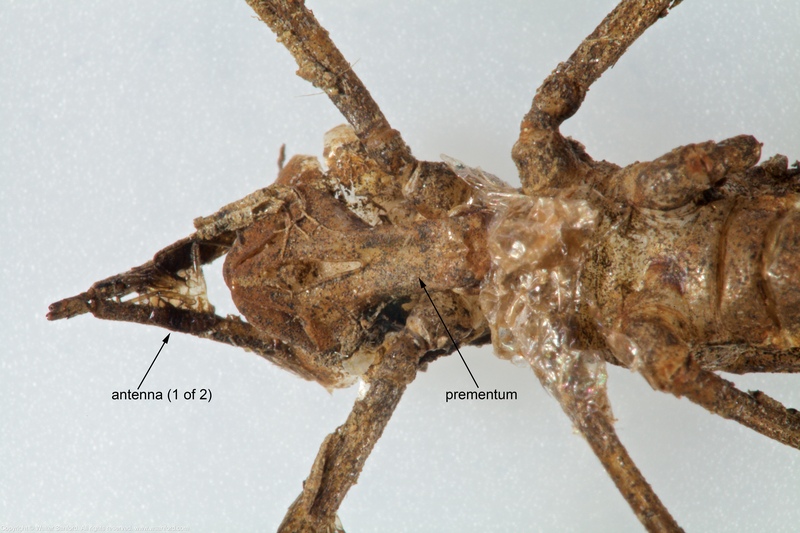 The specimen has a mask-like labium that covers the face, characteristic of four families: Cordulegastridae (Spiketails); Corduliidae (Emeralds); Libellulidae (Skimmers); and Macromiidae (Cruisers). 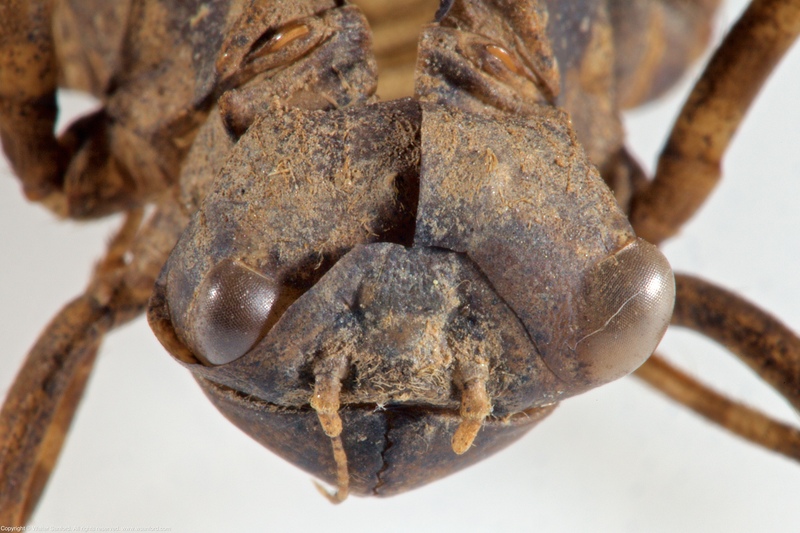 There is no horn on top of the face-head, characteristic of Macromiidae, so it’s not a cruiser. Notice that dorsal hooks are present and well developed on most abdominal segments. 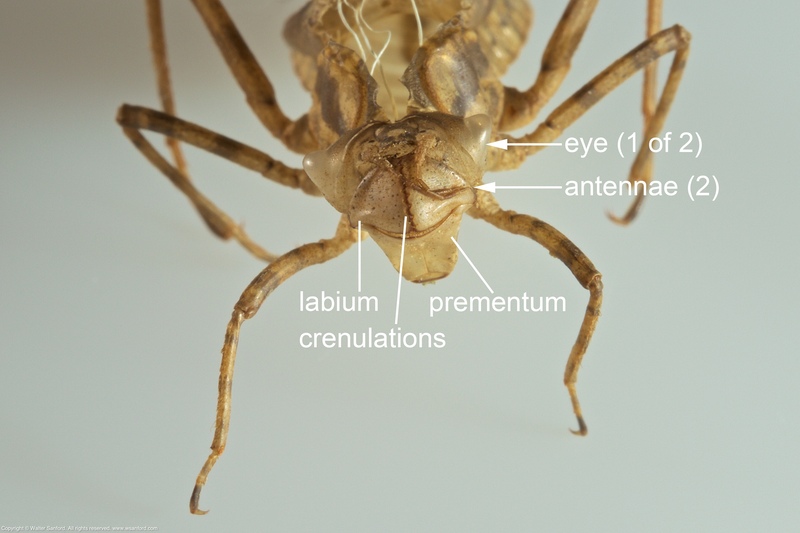 A lateral view of the exuvia provides a good look at the labium, also known as the mentum, a two-segment hinged “jaw” that is used to grab food: the prementum is the segment of the labium closer to the mouth; the postmentum is the segment closer to the base of the head. 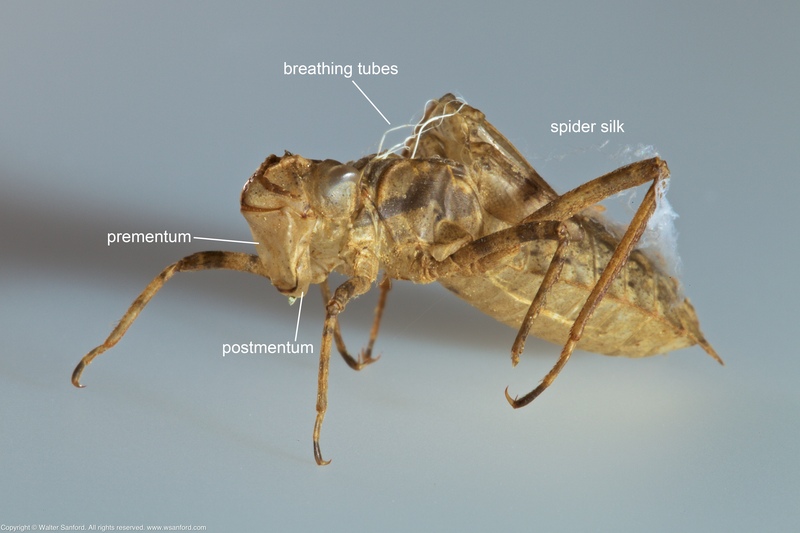 The white filaments that extend from the split in the thorax (as shown in Photo No. 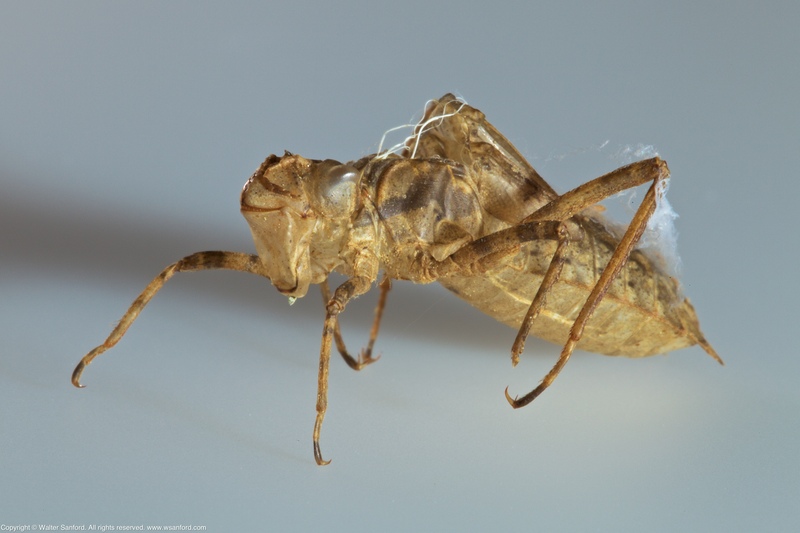 1-7) are breathing tubes, artifacts of the unique respiratory system of dragonfly nymphs. 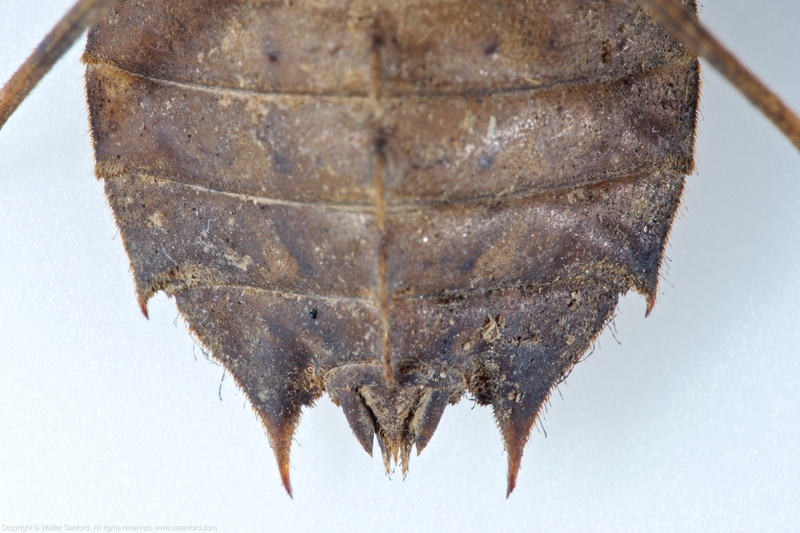 A closer view of the head shows two “bumps” that may be a pair of tubercles. 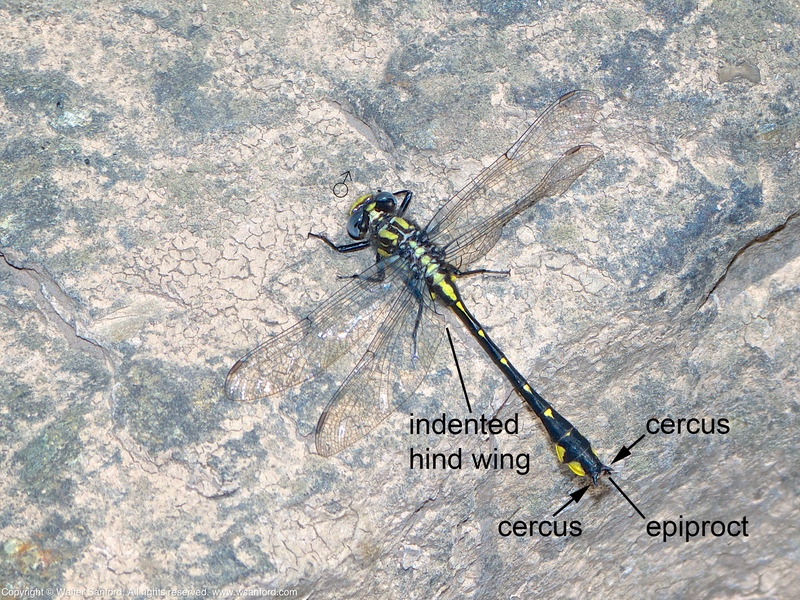 Characters from Identification Keys to Northeastern Anisoptera Larvae, dichotomous keys compiled by Ken Soltesz, were used to identify the genus and species for the exuvia. Although palpal/mental setae were not examined, all other characters match Epitheca cynosura. dichotomous key: a key for the identification of organisms based on a series of choices between alternative characters. Source Credit: Merriam-Webster Dictionary. Alternate Key to the Genera of the Family Corduliidae, p. 29. Key to the species of the genus (subgenus) Tetragoneuria, p. 32. 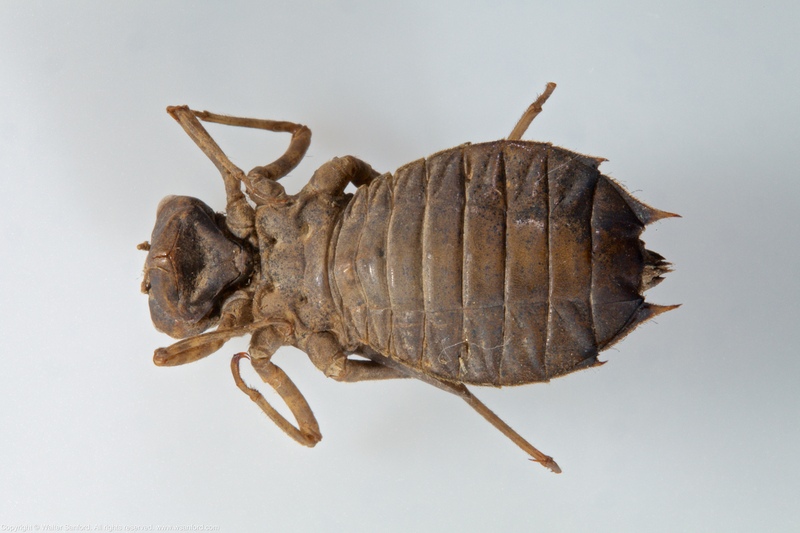 The last photo shows a ventral view of the exuvia. 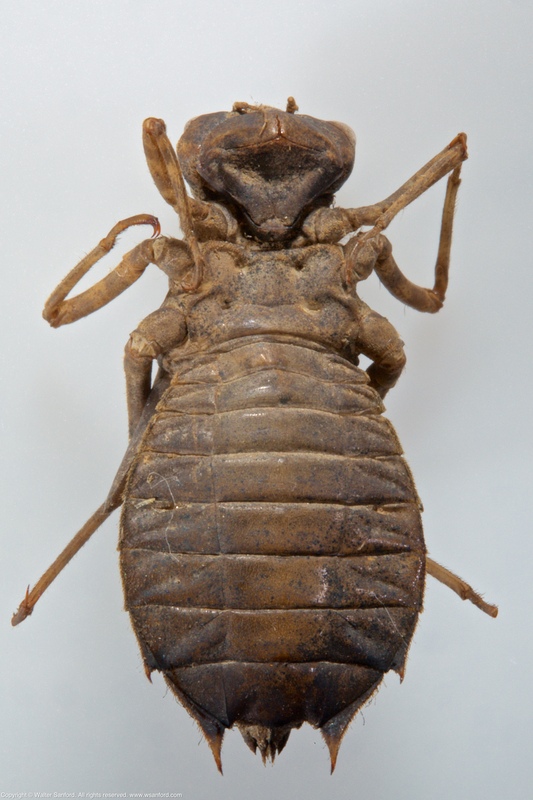 The vestigial hamuli located between abdominal segments two and three (S2-3) strongly suggests this individual is a male, therefore this specimen probably is not the same exuvia from which the teneral female emerged. 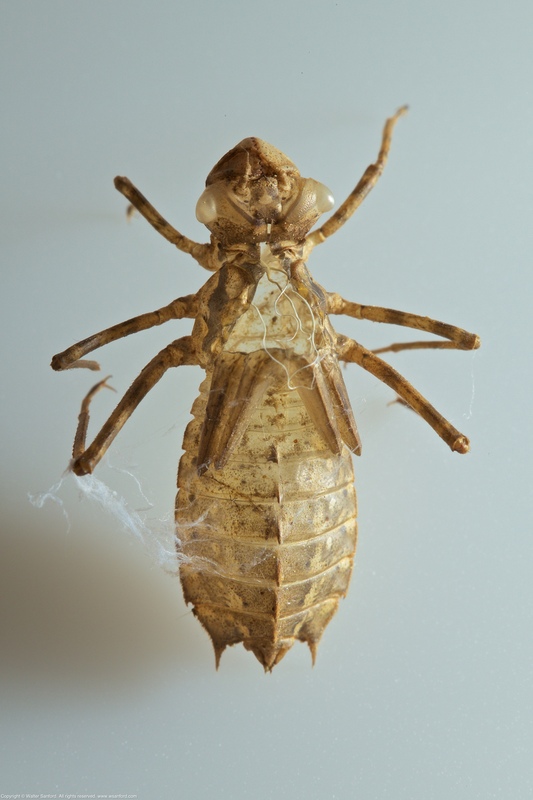 Identification Keys to Northeastern Anisoptera Larvae, compiled by Ken Soltesz: Alternate Key to the Genera of the Family Corduliidae, p. 29; Key to the species of the genus (subgenus) Tetragoneuria, p. 32. Editor’s Note: Sincere thanks to Sue Gregoire, Kestrel Haven Migration Observatory, for verifying my tentative identification, and for sharing some good odonate nymph knowledge regarding vestigial hamuli! The following equipment was used to shoot all of the preceding photographs: Canon EOS 5D Mark II digital camera, in manual mode; Canon EF100mm f/2.8L Macro lens (set for manual focus) plus a Kenko 20mm macro automatic extension tube; Canon 580EX II external flash tethered to the camera by a coiled six-foot Vello Off-Camera TTL Flash Cord for Canon Cameras, off-camera, in manual mode; the Canon flash optically triggered a small Nissin i40 external flash (in SF mode) used for backlight; and a Sunpak LED-160 Video Light with a white translucent plastic filter used for side light. Adobe Photoshop CC 2017 was used to annotate selected images. When I started experimenting with completely automated focus stacking using CamRanger, I couldn’t tell what, if anything, was happening. In fact, I wasn’t sure the process was working as advertised. 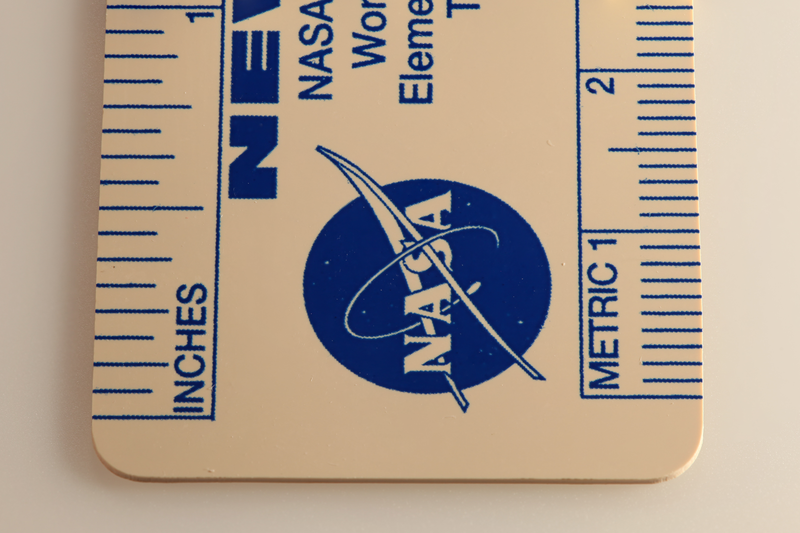 So I devised a plan to photograph a simple subject (a six-inch ruler in this case) and use “focus peaking” to track what happened. By the way, it’s worth noting that my Canon EOS 5D Mark II DSLR camera doesn’t feature focus peaking, but the CamRanger app does! During initial testing, I shot several small focus stacks. The following screen capture shows the display on my iPad mini (with retina display) running the CamRanger app; the focal plane of the lens is highlighted by red focus peaking. Here’s a screen capture from another test, showing the final location of the focal plane (highlighted in red). I made a movie that demonstrates what happens when CamRanger creates a focus stack. 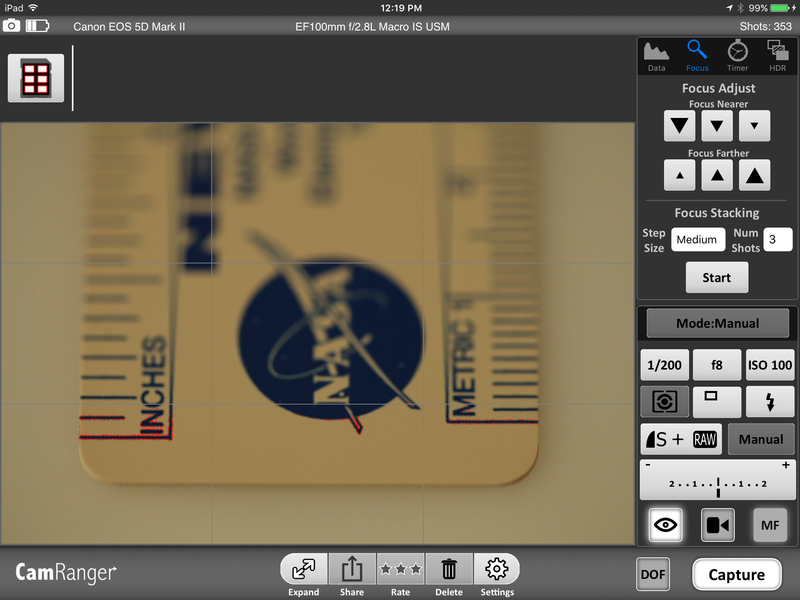 It was fun to watch the focal plane advance along the ruler as CamRanger captured the shots automatically! The movie begins with a small focus stack using a “Large” step size (the largest increment of three options). When focus stacking is active, notice that most of the screen is covered by a translucent gray layer that prevents the user from changing settings accidentally. I cancelled the focus stack after two shots. Next I changed the step size to “Medium” and started a new stack. Notice that the focal plane of the lens begins where the last focus stack ended. The new step size is noticeably smaller. As shown in the right side bar of the CamRanger app, I set the camera to shoot RAW plus small JPG. Both file types are recorded on the memory card in the camera; thumbnail versions of the JPG files are displayed at the top of the iPad screen. Although I usually shoot RAW only, JPG files can be transferred via WiFi faster than RAW files! I set the CamRanger app to wait 10 seconds between shots, in order to allow adequate time for the camera to write the image files to the memory card, transfer the JPG thumbnail from the camera to the app, rack the lens to the next focal plane, and for the external flash units to power cycle. I created a 30-layer focus stack using a medium increment. The following photo shows the JPG version of the first layer. I used Adobe Photoshop CC 2017 to create a medium-increment focus stack using the small JPGs because they can be processed faster than RAW. The resulting composite image is shown below. Finally, here’s the resulting composite image of a five-layer focus stack created from large increment/medium JPG photos. In my opinion, the output looks almost as good as the composite image created from five times as many layers. Given a choice, run the CamRanger app on the most powerful tablet you own. I use my iPad mini rather than iPad 3 (with retina display). Although the iPad 3 screen is larger than the iPad mini, it features a slower processor. That being said, the iPad 3 is perfectly suitable for using the CamRanger app for other less processor-intensive tasks. Some lenses, such as my Canon EF100mm macro lens, can be set for manual focus and the CamRanger app can still rack focus automatically. 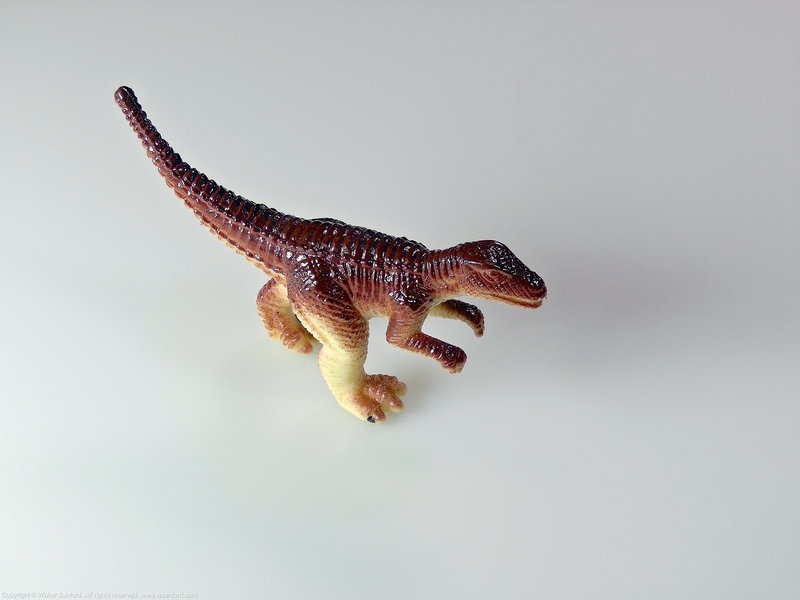 It may be necessary to set other lenses for automatic focus in order to work with focus stacking in CamRanger. If possible, use continuous light sources rather than external flash units. I love me some flash triggers, but they’re not 100% reliable. If you’re shooting stills and the flash fails to fire, it’s no big deal — just shoot another shot. Not so when you miss a critical focus layer. I use a combination of two small LED light sources and a Canon Speedlite tethered to the camera by a Vello flash cable; the Canon flash optically triggers a small Nissin i40 external flash (in SD mode) used for backlight. It’s challenging to determine how many layers to shoot for a given focus stack, especially when using smaller step sizes. Don’t sweat it! Simply shoot more layers by starting where the focal plane is at the end of the last focus stack. Repeat as necessary until you capture as many layers as needed. 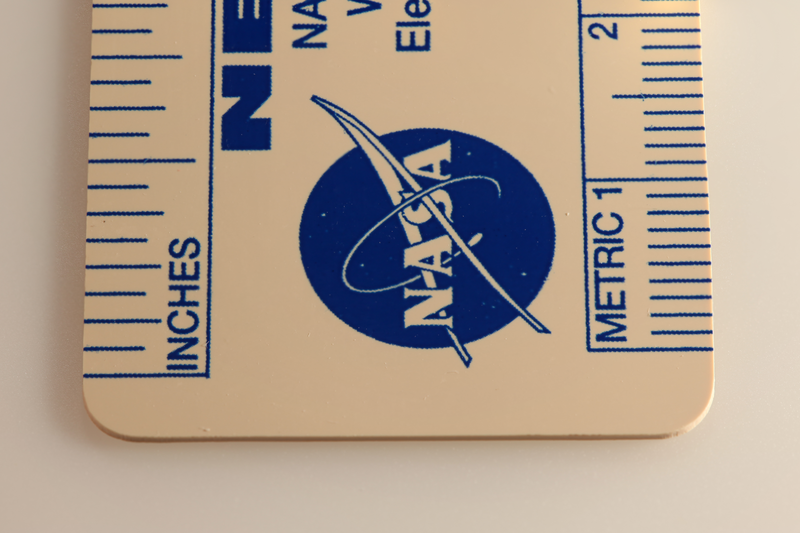 Going forward, my plan is to experiment with automated focus stacking using subjects that are more complex than the ruler featured in this post. 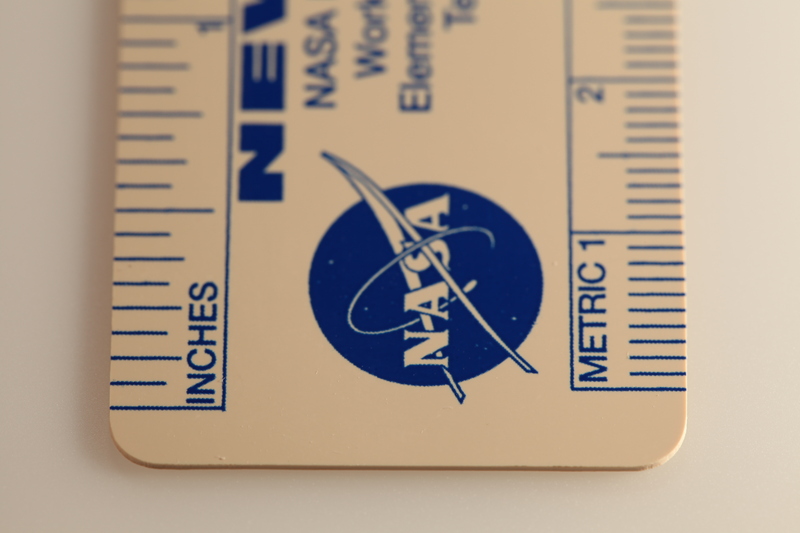 Preliminary testing suggests it could be challenging to create perfect composite images of objects that are more three-dimensional than the ruler. I used QuickTime to create the embedded movie (shown above) by tethering my iPad mini to a MacBook Air laptop computer and following the excellent directions provided in How To Display your iPad or iPhone on your Mac (9:44), a tutorial video by Terry White, Adobe Evangelist. Full disclosure: There are hardware/software solutions for wireless tethering and automated focus stacking that are less expensive than CamRanger. Remember, you get what you pay for! Case Air Wireless Tethering System. Case Remote – Affordable WiFi Control (12:27) provides an objective product review. DSLR Controller – TL-MR3040, by Jorrit Jongma (4:38). See also Guide: Creating a wireless remote from a TP-Link TL-MR3040. 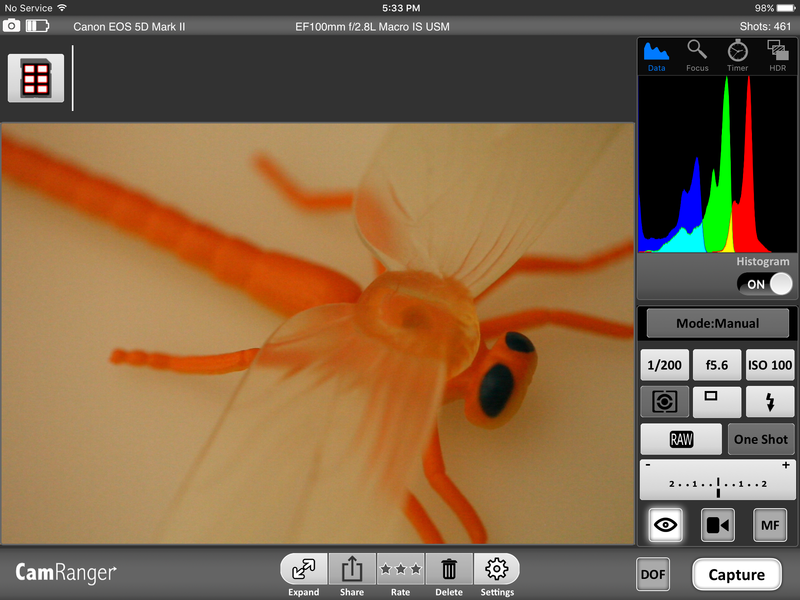 I used CamRanger to remotely control my Canon 5D Mark II DSLR camera with an Apple iPad 3 (with retina display). The camera was set for manual exposure and One-Shot AF. I used an aperture of f/5.6 with my Canon 100mm macro lens; I think I’ll use f/8 next time. 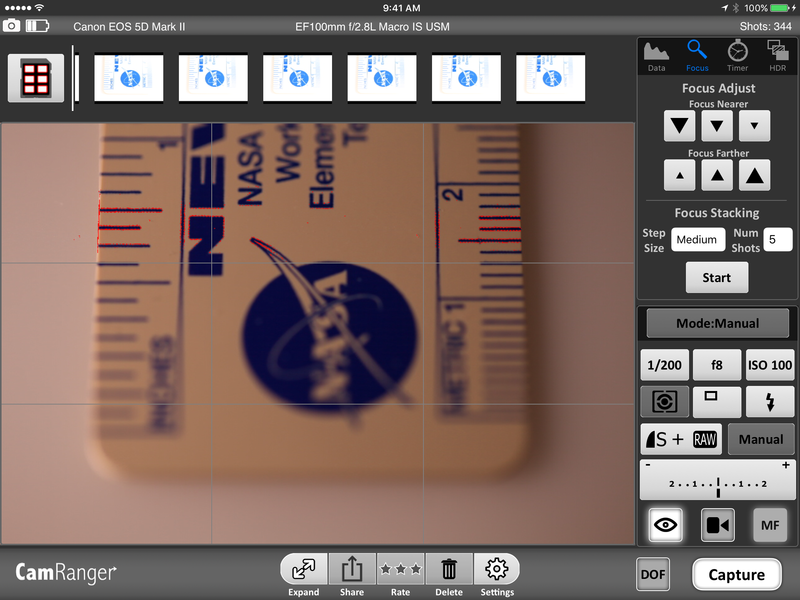 The CamRanger app for Apple iOS can be used to set the focus point by tapping on the iPad screen. 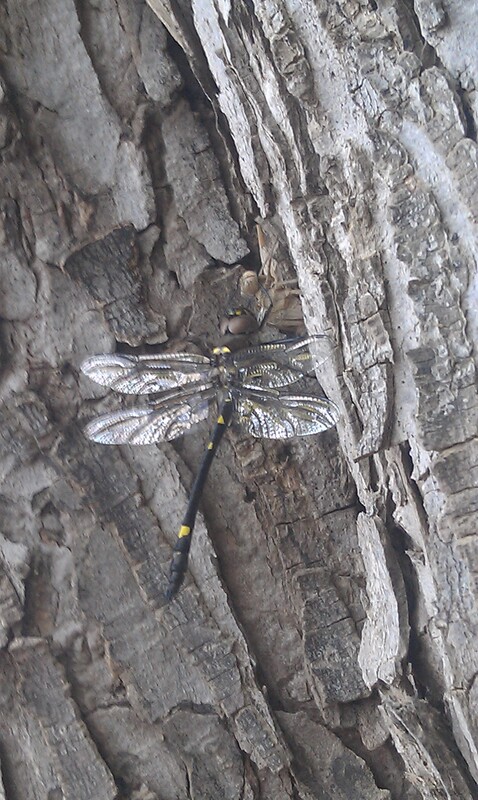 I focused on the toy dragonfly in approximately 10 places and tapped the “Capture” button to take a photo. 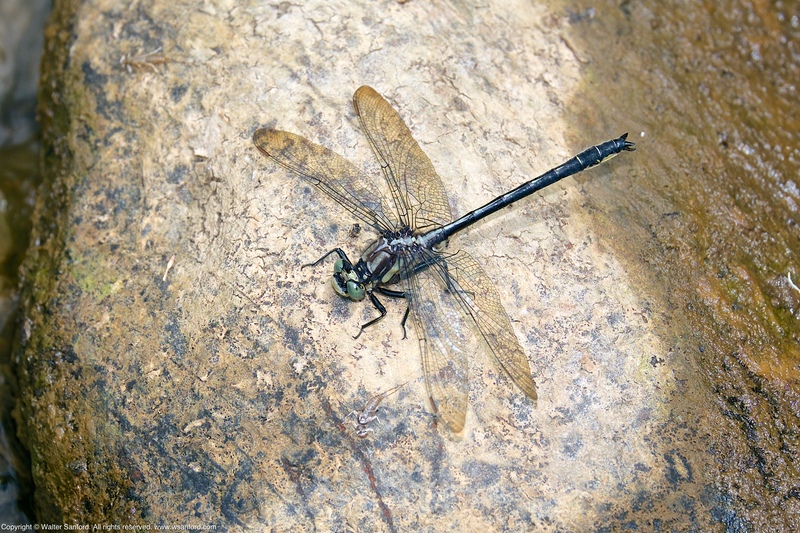 The following photo shows one of the resulting images, focused on the head of the dragonfly. Adobe Photoshop CC 2017 was used to create a “focus stack” composite image. 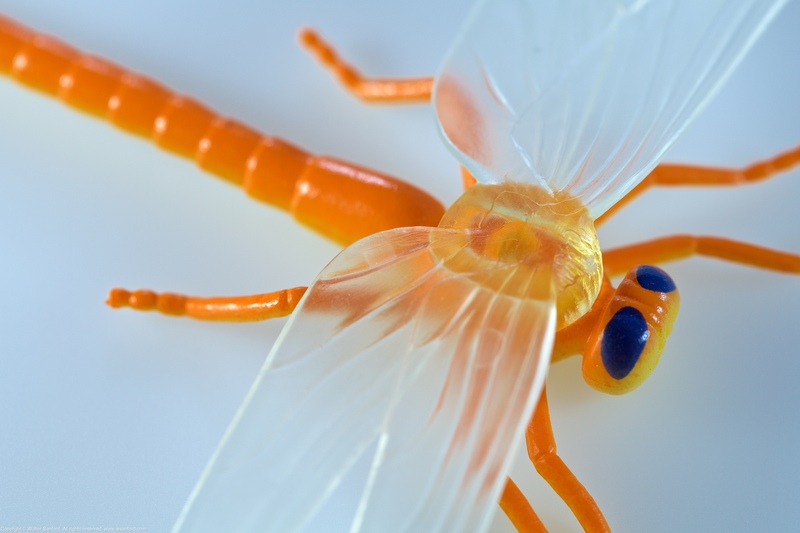 As you can see, most of the toy dragonfly is in focus but there are some places that are slightly blurry/ghostly. The obvious solution: Focus on more places (that is, take more pictures), although that might be unnecessary using an aperture of f/8 or smaller. Composite image created using Adobe Photoshop CC 2017. Going forward, my plan is to progress from manually setting the focus point by tapping on the iPad screen to using the automated focus stacking feature in the CamRanger app. Baby steps, Bob! The following equipment was used to shoot all of the photographs in the focus stack: Canon EOS 5D Mark II digital camera, in manual mode; Canon EF100mm f/2.8L Macro lens (set for automatic focus); Canon 580EX II external flash, off-camera, in manual mode; Canon 580EX external flash, off-camera, in manual mode; and a Yongnuo YN-622C-TX E-TTL II Wireless Flash Controller for Canon plus a two-pack of Yongnuo YN-622C II E-TTL Wireless Flash Transceivers for Canon. Additional backlight was added to the scene using a Nissin i40 external flash unit (off-camera, in SF mode). Adobe Photoshop CC 2017 was used to create the focus stack and post-process the composite image. 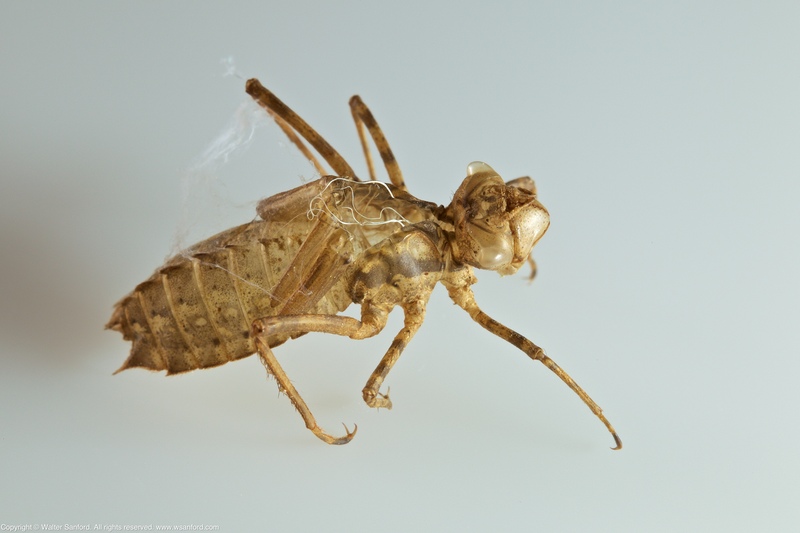 When this blog post was published on 19 April 2016, I was a novice at identifying odonate exuviae and I was just starting to get serious about studio macro photography. 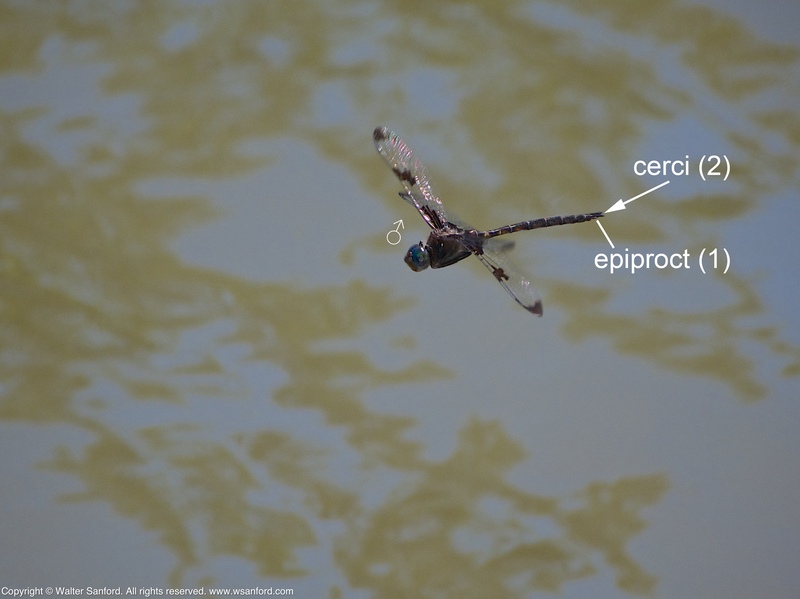 At the time, I was satisfied to be able to identify the dragonfly exuvia as a member of the Family Macromiidae (Cruisers). I’ve learned a lot since then, including the identity of the specimen to the genus/species level. This is a Swift River Cruiser dragonfly (Macromia illinoiensis) exuvia that was collected along the Potomac River in Fairfax County, Virginia USA. 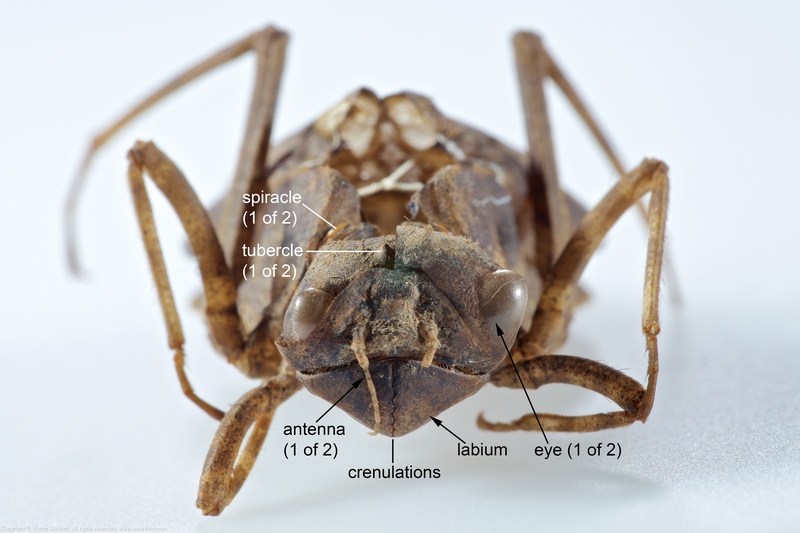 The first annotated image shows several characters that were used to identify the exuvia to the family level, including a mask-like labium featuring spork-like crenulations and a horn between its pointy eyes. The following dorsal view of the exuvia provides enough clues to identify the specimen to the genus/species level. The lateral spines of abdominal segment nine (S9) do not reach the tips of the inferior appendages (paraprocts), and if you look closely at the full-size version of the preceding photo then you should see a small mid-dorsal hook on abdominal segment 10 (S10). These characters indicate the genus is Macromia. Notice the lateral spines of abdominal segments eight and nine (S8-9) are “directed straight to rearward,” indicating the species is illinoiensis. 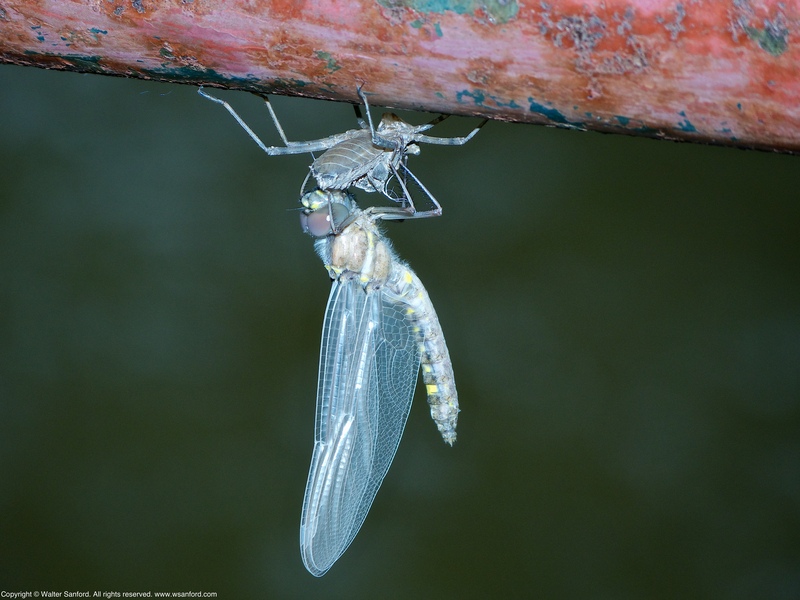 The last photo shows a teneral male Swift River Cruiser dragonfly clinging to the exuvia from which it emerged — the same exuvia featured in this post! Matt Ryan collected the exuvia after the adult dragonfly flew away from its perch. When Matt gave the exuvia to me several years later, he was unable to remember where it was collected. 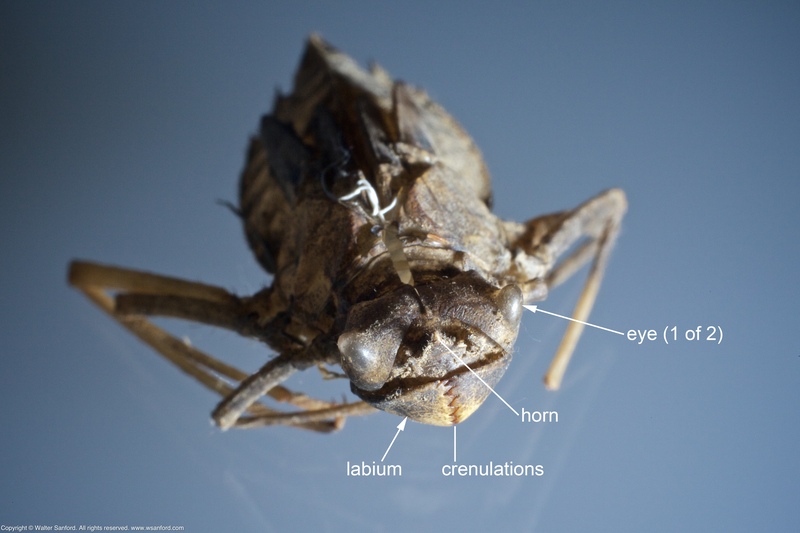 As soon as I was able to identify the exuvia to the genus/species level, I remembered seeing the following photo posted in one of Matt’s spottings on Project Noah. Photo used with permission from Matthew J. Ryan. 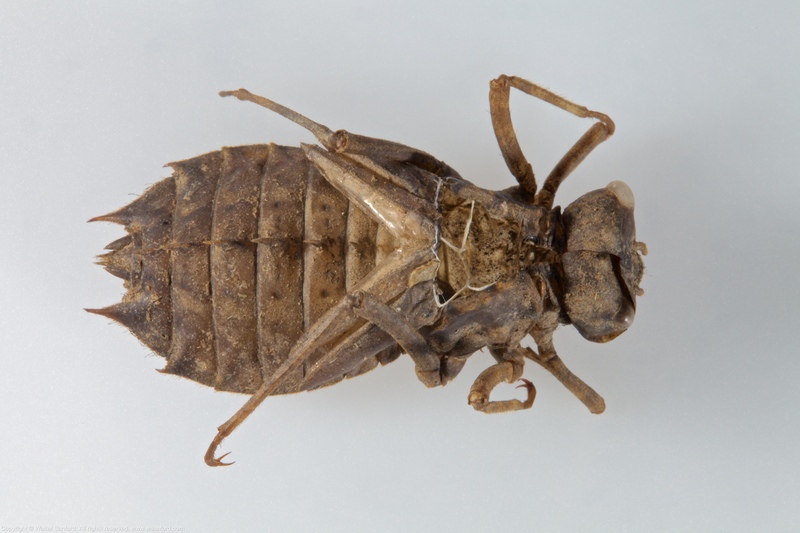 With a little detective work, I was able to solve the mystery of the specific identity of the exuvia as well as when and where it was collected. Like I said, I’ve learned a lot since I published the first blog post related to this specimen! Editor’s Notes: A funny thing happened on the way to the forum. I rediscovered the “Key to the Genera of the Family Macromiidae” (p. 27, shown above) while paging through the document Identification Keys to Northeastern Anisoptera Larvae in search of the “Key to the Genera of the Family Corduliidae” (page 28). One look at the line drawing at the bottom of p. 27 and I knew the specific identity of the cruiser exuvia. 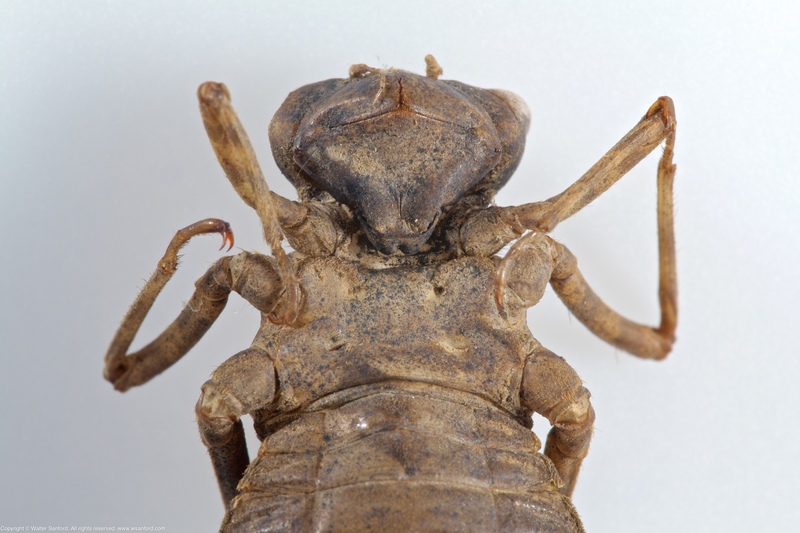 I need to refresh this blog post with more annotated images of the Macromia illinoiensis exuvia, including one that clearly shows the mid-dorsal hook on S10, but I was so eager to update the old post that I couldn’t wait to shoot and post-process the new images. 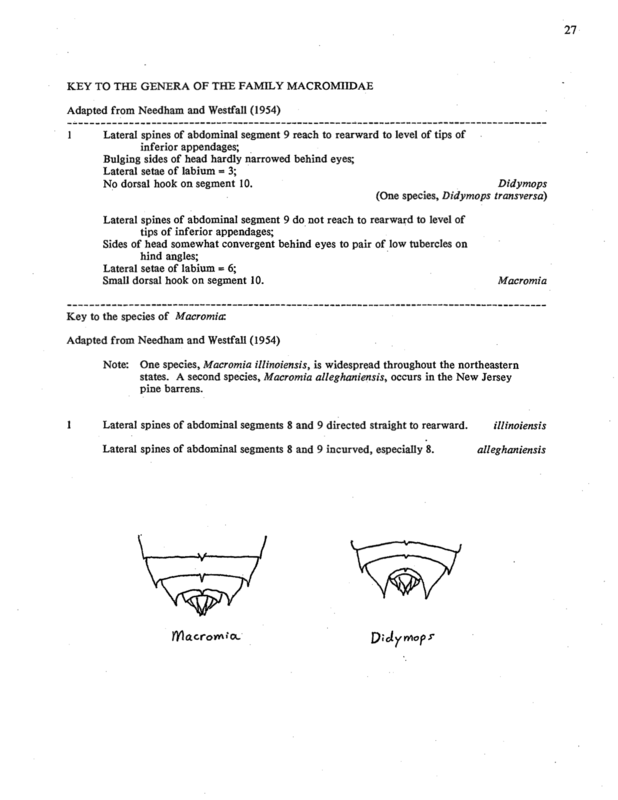 Identification Keys to Northeastern Anisoptera Larvae, compiled by Ken Soltesz: Key to the Genera of the Family Macromiidae, page 27. There are five families of damselflies (Suborder Zygoptera) in the United States of America, although only three families occur in the mid-Atlantic region: Family Calopterygidae (Broad-winged Damselflies); Family Coenagrionidae (Narrow-winged Damselflies); and Family Lestidae (Spreadwings). 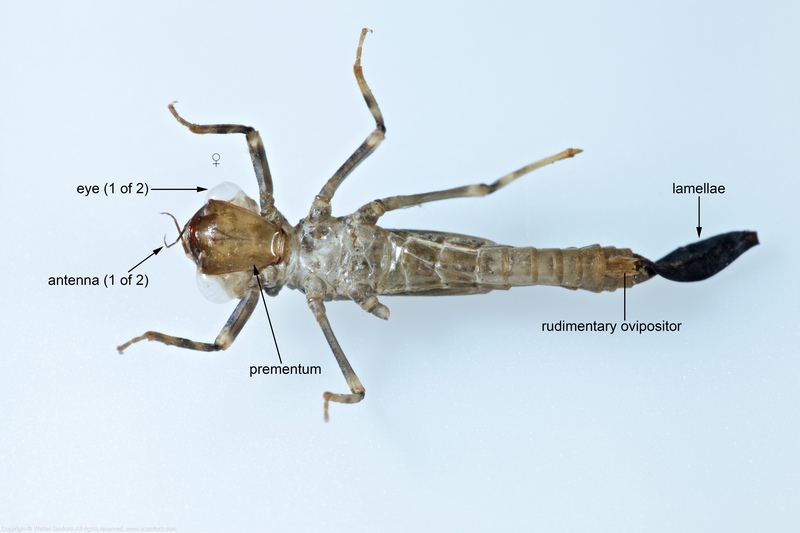 Pattern recognition can be used to tentatively identify damselfly larvae/exuviae to the family level: the shape of the prementum is characteristic for each of the three families; mnemonics can be used to remember each distinctive shape. 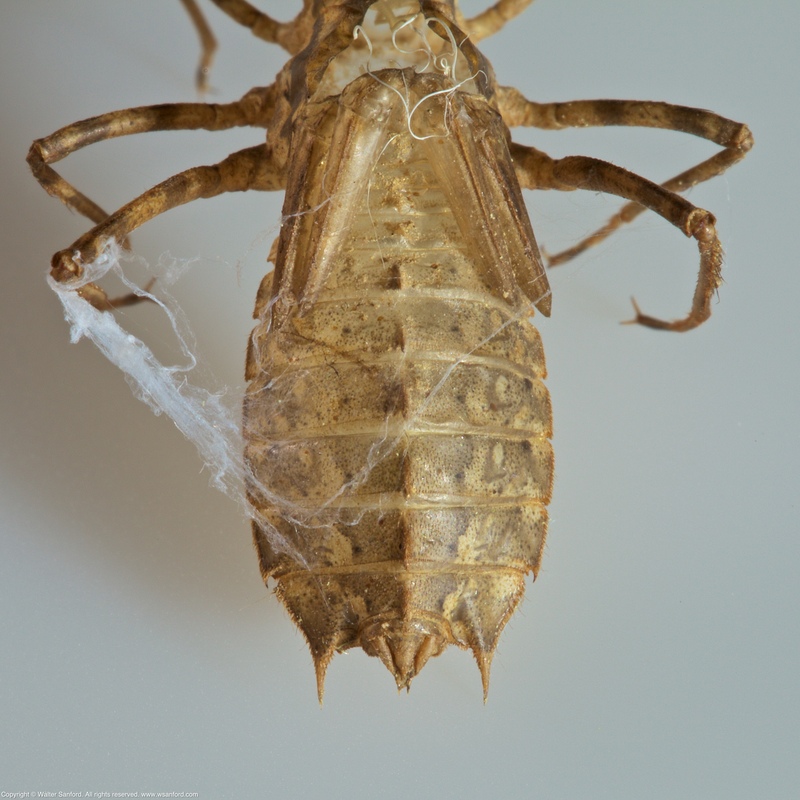 Family Calopterygidae features a prementum with a shape that looks somewhat similar to Family Coenagrionidae. Look for an embedded raindrop shape, located toward the upper-center of the prementum. An Ebony Jewelwing damselfly (Calopteryx maculata) exuvia was collected along a small stream located in eastern Fairfax County, Virginia USA. The shape of the prementum for Family Coenagrionidae reminds me of a keystone. A Narrow-winged Damselfly exuvia — probably Argia sp. (it’s a work in progress) — was collected along the Potomac River in Fairfax County, Virginia USA. This individual is a female, as indicated by the rudimentary ovipositor located on the ventral side of her abdomen. The lamellae, also known as caudal lamellae, are external structures used by damselfly larvae for both respiration and locomotion. 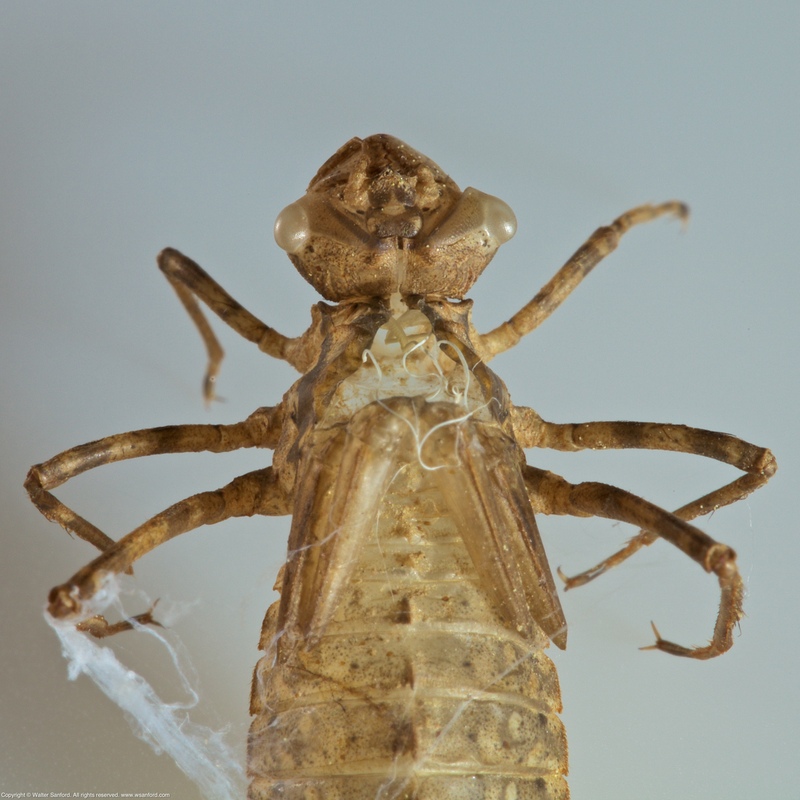 In contrast, the respiratory system for dragonfly larvae is internal. 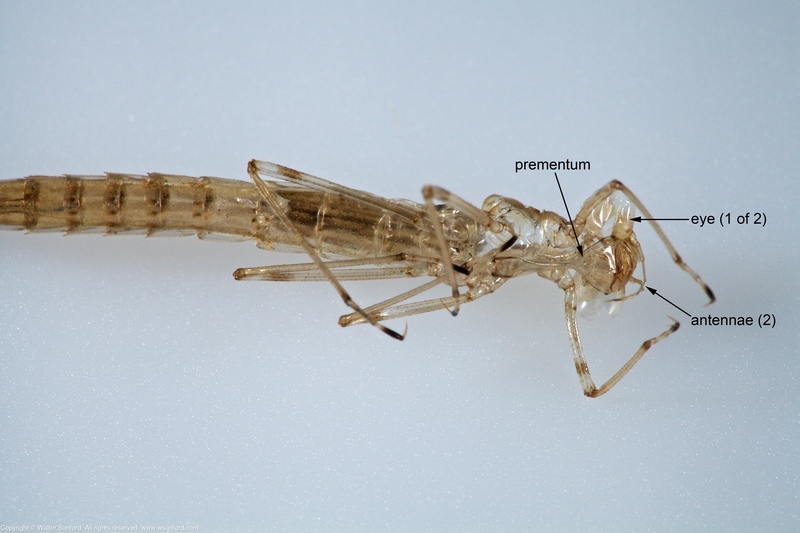 Characteristics of the caudal lamellae (including shape of/patterns on) are some of the clues that can be used to identify damselflies to the genus/species level. The unique shape of the prementum for Family Lestidae reminds me of a rattle (musical instrument). A damselfly exuvia from the Family Lestidae (Spreadwings) was collected from a small vernal pool located in eastern Fairfax County, Virginia USA. Although the genus/species is unknown (again, it’s a work in progress), both Slender Spreadwing (Lestes rectangularis) adults and Southern Spreadwing (Lestes australis) adults were observed at the vernal pool on the same day this specimen was collected. The first step is the hardest, as the saying goes. In this case, it’s easier to identify damselfly larvae/exuviae to the family level than it is to identify specimens to the genus/species level. There are relatively few resources, especially online resources. The following links to two dichotomous keys and a pattern-matching guide for caudal lamellae should help you get started. Many of the same species of damselflies that are known to occur in Michigan, Florida, and the Carolinas can be found in the mid-Atlantic region. 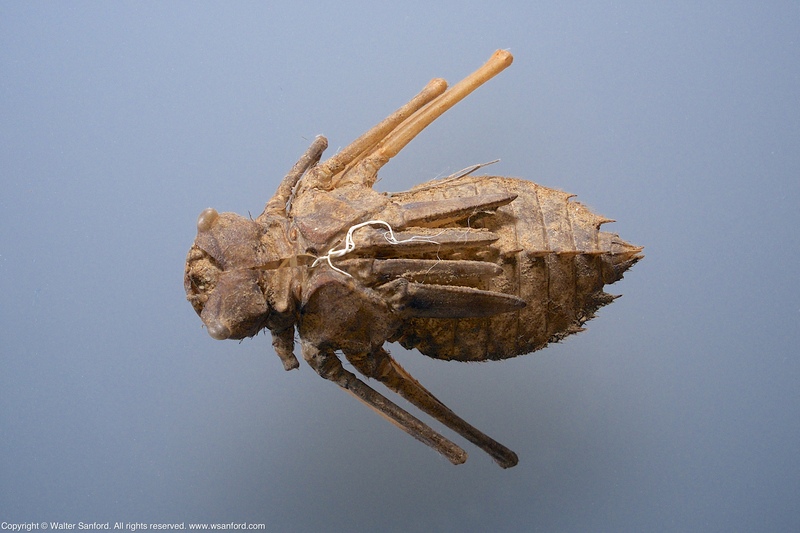 The following Prince Baskettail dragonfly (Epitheca princeps) exuvia, on temporary loan from a friend, had been identified before I borrowed the specimen. 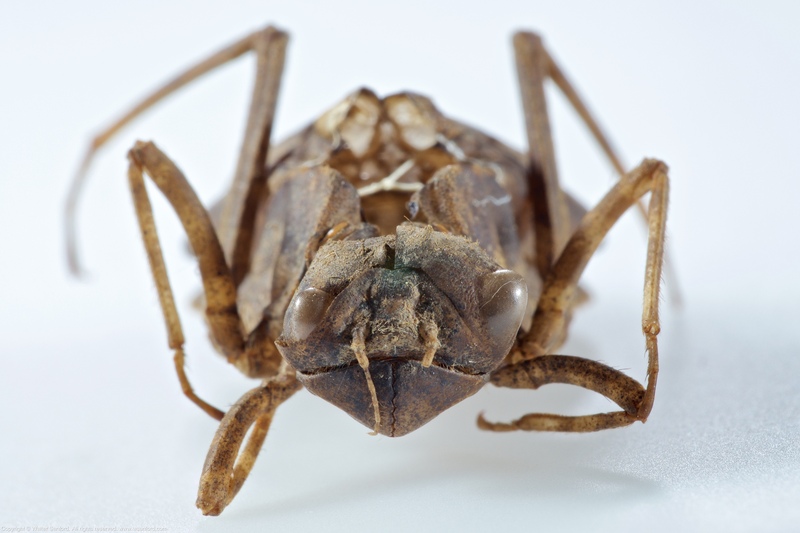 A two-step process was used to verify the genus and species of the exuvia. Characters from two dichotomous keys were used to identify the genus and species for the exuvia. Although palpal/mental setae were not examined, all other characters match Epitheca princeps. Identification Keys to Northeastern Anisoptera Larvae, compiled by Ken Soltesz. Key to the Families of Anisoptera, page 5. Key to the Genera of the Family Corduliidae, page 28. Corduliidae Selys – Emeralds, Odonata Nymphs of Michigan, by Ethan Bright and Mark F. O’Brien, UMMZ-Insect Division. “With lateral spines on Ab8 [S8].” “Lateral spines on Ab9 [S9] at least 2.0x as long as those on Ab8 [S8], at least equal to mid-dorsal length of Ab9 [S9].” The cerci are at least half as long as the paraprocts. Photo No. 5 shows a wider view of the ventral side of the specimen. Photo No. 6 shows a zoomed-in view of the prementum. Photo No. 7 shows another view of the prementum. Identification Keys to Northeastern Anisoptera Larvae, compiled by Ken Soltesz: Key to the Families of Anisoptera, page 5; Key to the Genera of the Family Corduliidae, page 28. Odonata Nymphs of Michigan, by Ethan Bright and Mark F. O’Brien, UMMZ-Insect Division: Corduliidae Selys – Emeralds; Epitheca Burmeister, 1839 (Corduliidae) – Baskettails. The following equipment was used to shoot all of the preceding photographs: Canon EOS 5D Mark II digital camera, in manual mode; Canon EF100mm f/2.8L Macro lens (set for manual focus) plus a Kenko 20mm macro automatic extension tube and a Raynox DCR-250 close-up filter; Canon 580EX II external flash, off-camera, in manual mode; Canon 580EX external flash, off-camera, in manual mode; and a Yongnuo YN-622C-TX E-TTL II Wireless Flash Controller for Canon plus a two-pack of Yongnuo YN-622C II E-TTL Wireless Flash Transceivers for Canon. A Canon Extender EF 1.4x II was used for more magnification in Photo No. 4, 6, 7 and 9. Adding the tele-extender results in a 1 f/stop loss of light; additional backlight was added to the scene using a Nissin i40 external flash unit (off-camera, in SF mode). Photo No. 8 and 9 show early work to get a good shot of the face-head, before Photo No. 1 emerged as the clear winner. I prefer Photo No. 1 because it provides the best view of the face-head, has the best composition and exposure, plus I like the way the exuvia seems to be floating in mid-air. Although I have never seen a perching adult Prince Baskettail dragonfly, I was fortunate to shoot the following photo of a male in flight, featured in the blog post Changing of the guard. 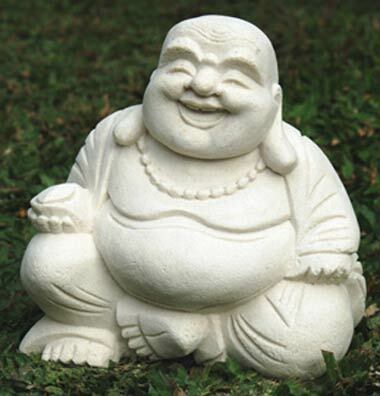 I found Buddha, in this case, the version known as “Happy Buddha.” (Notice the exuvia seems to be smiling.) I think I’ll rub Buddha’s belly to see whether it brings me good luck, prosperity and wealth. But seriously folks, this is a photo of a Prince Baskettail dragonfly (Epitheca princeps) exuvia on temporary loan. The date and location where the specimen was collected is unknown. 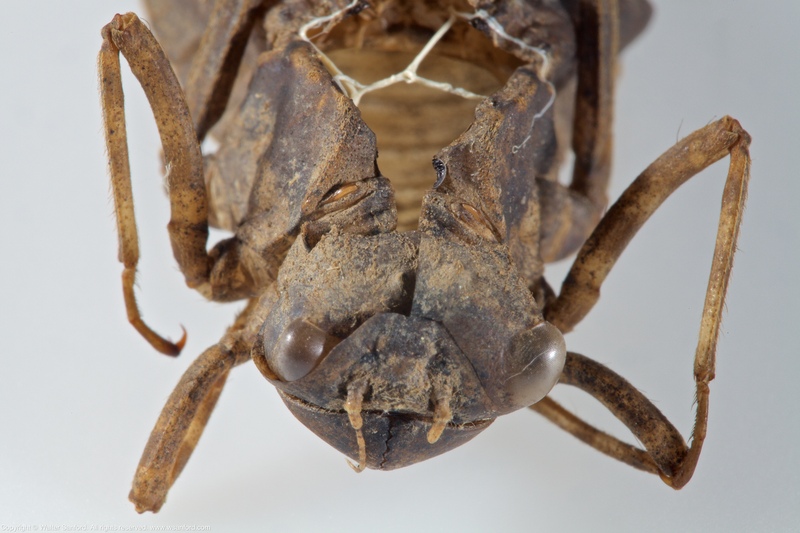 More photos of this exuvia (including several annotated images) will be published in an upcoming post. The following photo is the original. The preceding photo was cropped and rotated clockwise 90-degrees. You are currently browsing the archives for the Nissin i40 category.